Rumors continue to swirl about the political future of Mississippi’s powerful senior U.S. Senator, Thad Cochran. Correspondent Matt Laslo has been asking around about his health and his future at the U.S. Capitol and sent us this dispatch from Washington. At 80-years-old, Cochran has been a fixture in the Capitol for decades. He was sent to Washington in 1978, which puts him in the history books among the nation’s longest-serving senators. He used to chair the Agriculture Committee and he is still Chair of the Appropriations – or spending – Committee, but he’s slowed down a lot after struggling with health problems last year. We caught up with him in the Capitol and he reassured us his health is better. "I'm doing well," Cochran said. After that brief exchange, Cochran apparently became disoriented and his staffer cut off the interview and led him back to his office. Still, he’s only missed one non-controversial vote so far this year, after missing six votes in December following surgery. But Cochran has surely slowed down. Mississippi Democratic Congressman Bennie Thompson says he hasn’t talked to Cochran in eight to ten months, which is unusual because even though they’re from opposing parties, they’re also allies on many issues important to the state. "Oh yeah," says Thompson. "We'd talk all the time, but you know I think a lot of it has tended to be his health and I respect whatever he's going through, but we talk to the staff all the time." Cochran will have to give up his gavel on the spending committee at the end of this year because the GOP has term limits for committee chairs, but there are rumors that Majority Leader Mitch McConnell is already laying plans in the case Cochran retires early. Thompson says, either way, he would leave a huge hole for the state. "Oh. Well, Chairman of Appropriations to a state that for every dollar we send to Washington, we get about $3 back- significant," says Thompson. "In terms of his leverage in the last budget bill, he had fingerprints on that. It would be a major loss." Thompson is a Democrat but he’s heard the chatter that McConnell has asked Mississippi’s Governor Phil Bryant to replace Cochran if he retires early, which Bryant reportedly turned down. "Yeah. You understand that I'm not in the room right when that goes on?" Thompson continues, "But, I've heard that. I've heard names associated with it, but I've also heard that he's not going anywhere." Mississippi’s junior Republican Senator Roger Wicker won’t discuss Cochran’s future. "If you want to comment on rumors, I decline," says Wicker. Last year Cochran went months without formally chairing his committee, but as he walked through the Capitol grounds, Wicker said Cochran deserves praise for having his committee do its work on time, even if the spending bills were eventually blocked by Democrats. "We need to be very appreciative of the appropriations committee for having that work done on time each year including this fiscal year," says Wicker. Cochran also gets high marks from the top Democrat on the Appropriations Committee, Patrick Leahy of Vermont. "Oh, I think the world of him. He is and has been for decades, probably my closest friend in the Senate of either party," says Leahy. Leahy and Cochran come from a different generation of the Senate – one filled with senators more focused on forging compromises than on grabbing splashy headlines on cable news. Leahy says he’s been able to work so well with Cochran because he’s a man of his word. "Well, and we're poles apart politically, but we've worked out so many things that knowing that neither one would ever break their word," Leahy recalls. "No, I think the world of him." Like other Republicans, Mississippi Congressman Gregg Harper won’t even discuss the rumors about Cochran’s future swirling about Washington and Mississippi. "I have no clue what others would be saying," says Harper. "My remarks would always be very positive and only positive about Senator Cochran and how much we still need him in Mississippi and what a tremendous job he's done." While it’s also been a while since Harper has talked to Cochran, he says he’s been getting updates on him and he thinks he’s not going anywhere anytime soon. "Look, first of all, I expect Senator Cochran to finish out his term," Harper insists. "That's what I know he would want to do and we need him to continue. 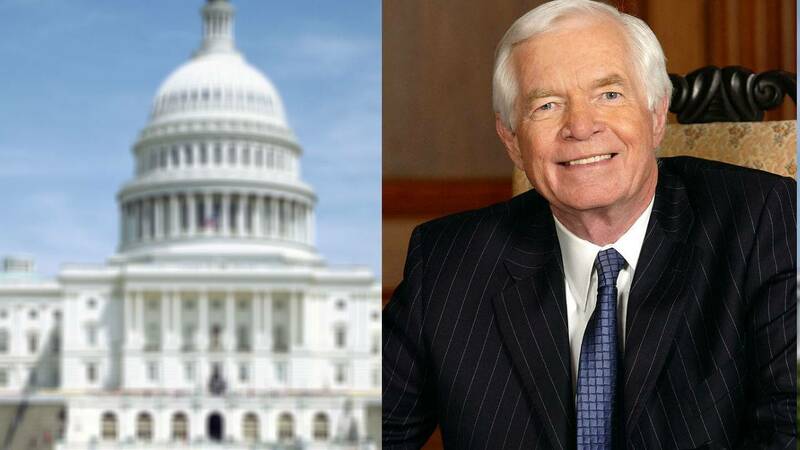 What he means to Mississippi and to the country- his work for national defense, ag issues, whatever you want to name is, being chairman of Appropriations has had a profound impact in a positive way for this country. So, what I would say is, we anticipate him staying and that's what we want."